1) Everyone in the story has his or her own tracks to cross in life. What challenges do Iris, Mrs. Nesbitt, Dot, Celeste, Iris’s father, Marie and Dr. Nesbitt need overcome? Do they accomplish this or not? 1) How would you describe Dot’s options regarding her pregnancy and her father? 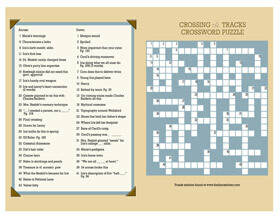 Download the crossword pdf and the puzzle answers. Book chats can include the writing process and an exploration of selected artworks and how I use them as inspiration. I also conduct “Novel Art Tours” either actual or virtual.